As a native of Cameroon and a woman, Moudio has embraced an academic discipline and a way of life that defy expectations, both her own and those of others. 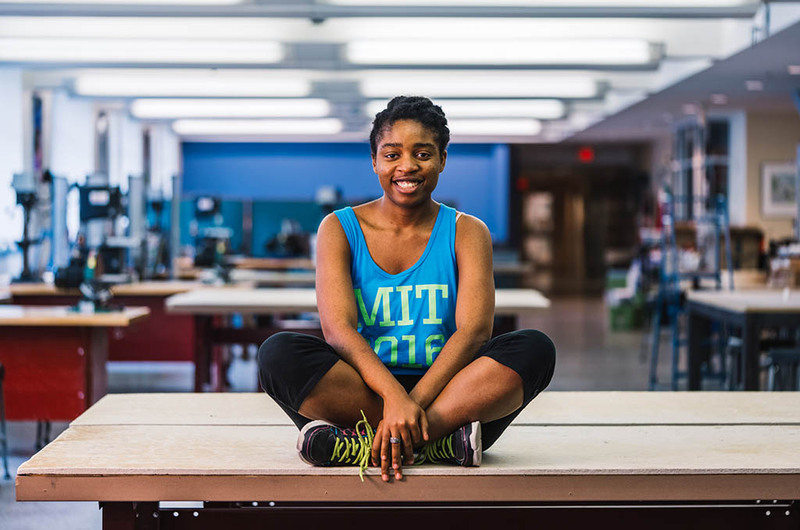 Her decision to attend MIT at all surprised her family and dashed their hopes that she would study medicine. Once here, she endured a difficult period of trial and error, struggling for focus until she found her home in the Department of Mechanical Engineering (MechE). Moudio knows she made the right choice, but she’s also aware that things look a little different from Cameroon, where, she says, many people believe that intellectual girls will never marry and there is outright disdain for single women in professions considered “male.” “You’re really pushing it if you study engineering — which is just completely silly,” she says. “I want to show Cameroonian girls that living an academic life does not mean throwing away your future. It means you have the freedom to think in new ways,” she said. For Moudio, mechanical engineering provided exactly the right path to the future. The creative design process has required she develop complex problem solving skills. She has learned to develop strategies, find solutions, test ideas, and think nimbly. She says such an education is a gift and, for her, carries with it a responsibility. She intends to push for innovation in Africa. Her undergraduate research seeks to remedy widespread energy needs in developing countries. She is considering how to make biomass, such as wood and agricultural waste, a more efficient fuel source, and the implications for her homeland are vast. About 2.5 billion people in developing countries rely heavily on such low-density biomass for over 90 percent of their household energy needs, yet much of it is wasted. In Sub-Saharan Africa and India, for example, 10 exajoules of biomass — nearly 20 percent of the energy needs in developing countries — is lost every year. Moudio and her colleagues seek to optimize the use of torrefaction systems, reactors that heat biomass at a very high temperatures of 250 to 300 degrees Celsius to produce a high-density fuel known as char. Unused biomass becomes an energy source. Small-scale models could one day be used by struggling farmers throughout the world. But “weird” quickly turned to quirky and charming. She found the student body favored sweatpants. Rather than listening in silence, students blurted out answers and challenged professors during lectures. Early on, she attended a party where people dressed in sheer clothing, as if naked, and rode an elaborate self-constructed merry-go-round. “I was like, ‘How crazy does it get here?’” By the time spring rolled around, she was nonplussed to come across students in superhero costumes during final exams.